The ARD RÍ HOUSE HOTEL located on the Milltown Road, Tuam, Co. Galway, invites you to enjoy a welcome, hospitality and service, last savoured in the time of ancient Irish kings, in the East Galway hinterland of low green fields and old stone walls offering the "Cead mile fáilte " of a bygone time. As you pass on your busy way, why not call and experience for yourself the hospitality and service usually the preserve of royalty. The Ard Ri House Hotel is conveniently located with Galway Airport and Galway City only 30 minutes distant while Ireland West ( Knock ) airport is 50 minutes away on the N17 to Sligo. A regular coach service is available to all main destinations from Bus Eireann. 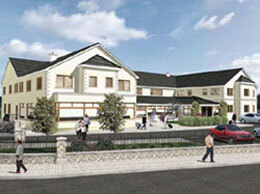 The ecclesiastical centre and historic town that is Tuam provides and attractive back drop to the Ard Ri House Hotel. The Hotel, in turn, boasts modern and well appointed banqueting and conference suites offering a superb venue for Wedding receptions and fit for a queen and king. In addition it also caters for regional conference, training seminars, parties and celebrations. In addition to the " Turlough Mor " Banqueting suite the hotel offers a further four suites of different capacity to facilitate these events. The Ard Ri House Hotel offers contemporary style with pleasant ambiance in the atmosphere of unhurried calm. 50+ bedrooms impeccably styled and furnished to provide the best in comfort and relaxation for our guests. The Ard Ri House Hotel is designed with you at mind, and to ensure that your overnight corporate stay, midweek break or get away weekend is a memorable experience. Its large open areas of foyer and lounge provide the opportunity to relax in quite surroundings. The team at the Ard Ri House Hotel are committed to ensuring your stay at the hotel is the best it can be. The depth of the management team's experience combined with relaxed and friendly attitudes provides a perfect blend to guarantee your hospitality and service usually the preserve of royalty. Relax in the contemporary and pleasant ambience of the Kiltevna restaurant. The restaurant team offer hospitality and service to compliment and complete a memorable dining experience and will strive to make it such that you will be enticed to return. The chef's brigade will offer food for you which is a fusion of classical and modern cuisine infused with flavour and presented with passion. whether an intimate meal for two, a business occasion, or a family celebration the Kiltevna restaurant team will provide you with a memorable experience.